The School of Theology and Interfaith Studies at EUCLID (Euclid University) offers a primary external (distance or online) degree program called the EUCLID Doctorate in Theology - Roman Catholic Studies (DRCTh). The degree is recognized by the Holy See under applicable UNESCO conventions. EUCLID congratulates Fr Jose Kuruvachira on the occasion of his recent meeting with Pope Francis held at the Vatican on January 9th 2014. 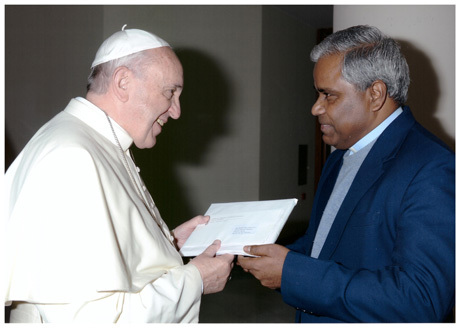 The Pope had invited our distinguished EUCLID faculty member to mark Fr Jose Kuruvachira's ordination jubilee and personally received a letter about EUCLID's important work in ecumenical and inter-religious dialogue (Rome; January 2014). Academic Paper by Jose Kuruvachira on "Dialogue and Mission"
Academic Paper by Jose Kuruvachira on "Revelation"
In accordance with international guidelines, this distance (non resident) doctoral program in Roman Catholic theology represents 90 US credits of coursework beyond the Bachelor's degree. 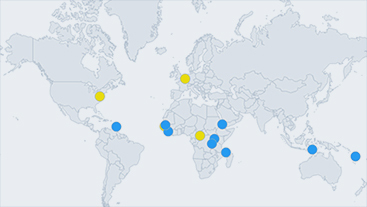 In practice, this represents about 55-60 US credits of coursework beyond the Master's degree. This includes 25 US credits granted for the thesis / dissertation which must result in a publishable work.